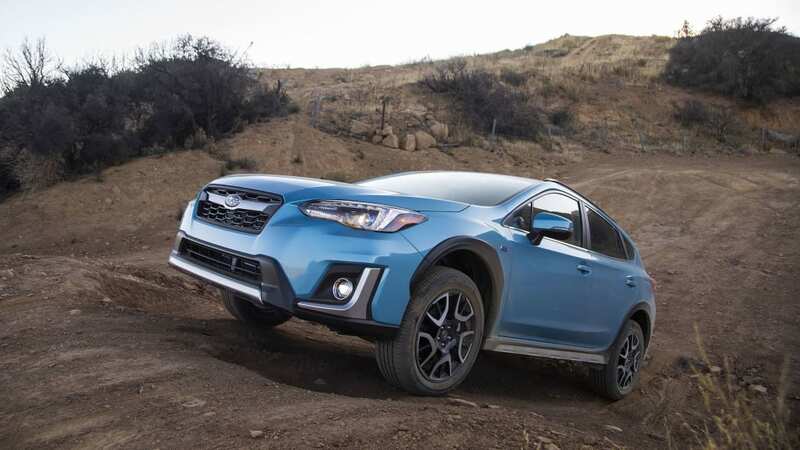 Autoblog rating for the Subaru Crosstrek Hybrid is not available. Please check back later. 15.9 / 43.1 Cu. 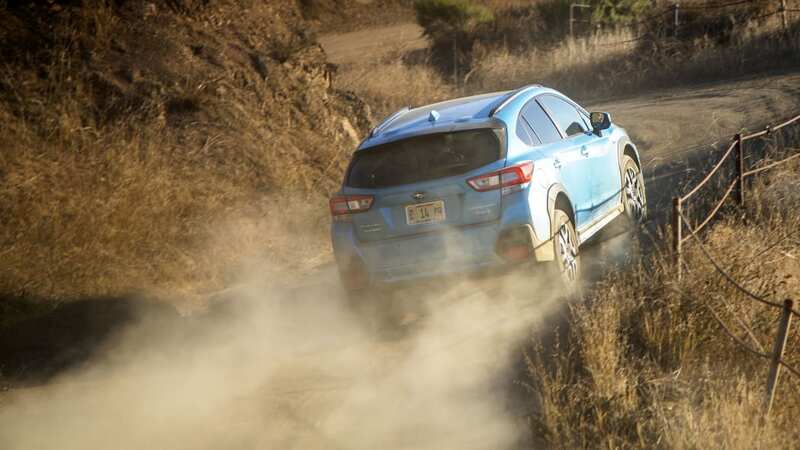 Ft.
SANTA BARBARA, Calif. — Subarus are pretty good to drive — capable, comfortable, generally affordable, interesting — and with one exception, they all offer all-wheel drive. And they're a relatively green company. 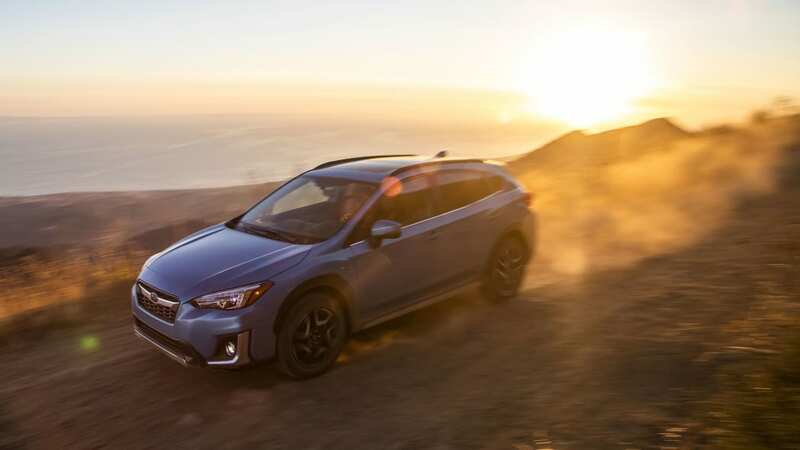 The active, outdoorsy and often socially conscious drivers appreciate things like Subaru's commitment to diverting waste from landfills. 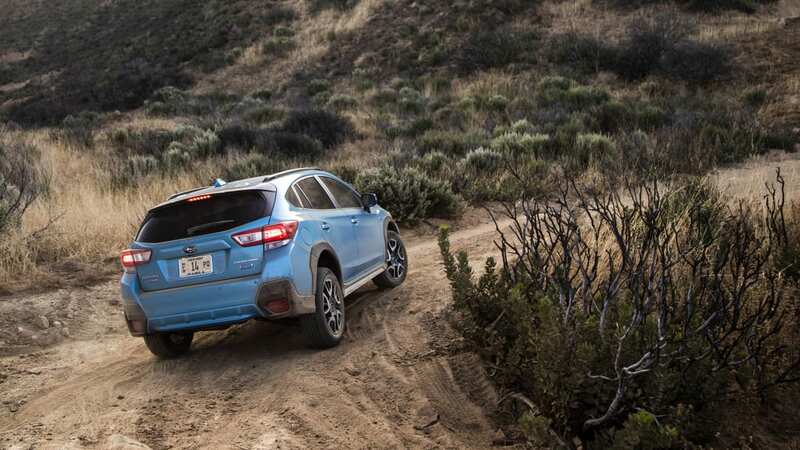 But there's a fact that's been nagging many of us who love to hug dogs, trees and the occasional Subaru: there's no electric option. 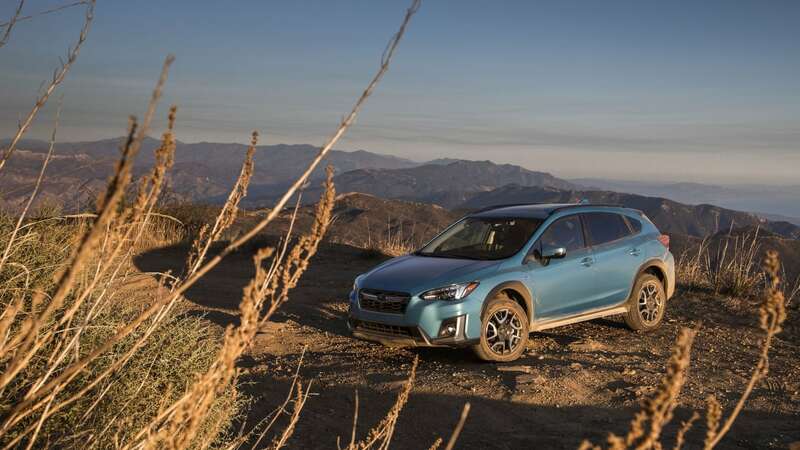 Subaru, an automaker small enough to get by with an efficient fleet of conventional gas vehicles, has been able to do without building a compliance car. 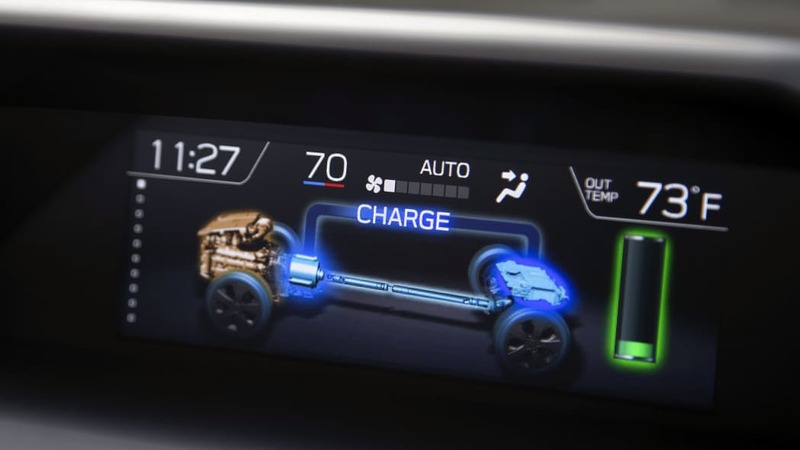 Still, an increasing number of Americans want to be able to plug in their vehicles. 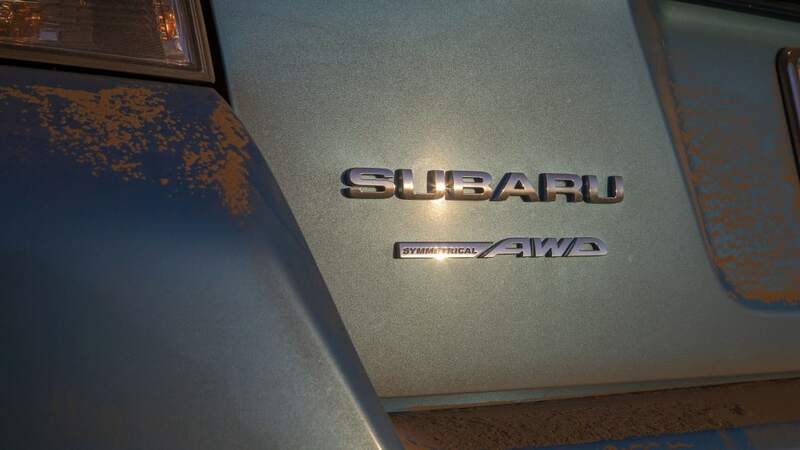 For loyal Subaru fans, brand love and eco-consciousness have increasingly difficult to reconcile. 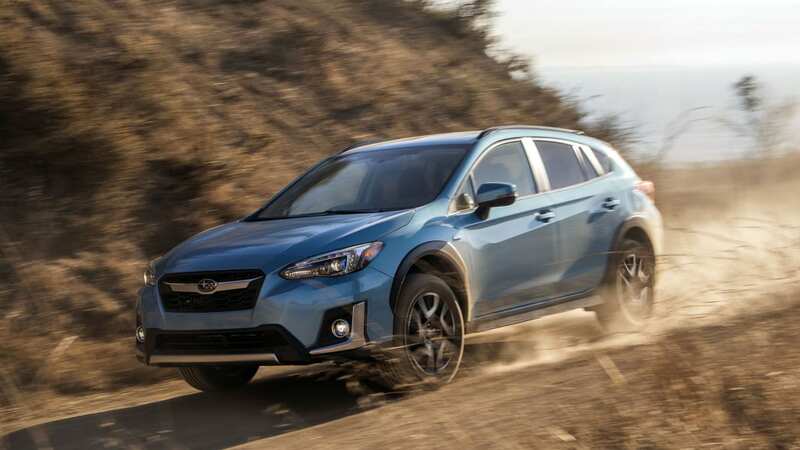 That changes now, and not because of any specific regulation, but because Subaru sees the demand. 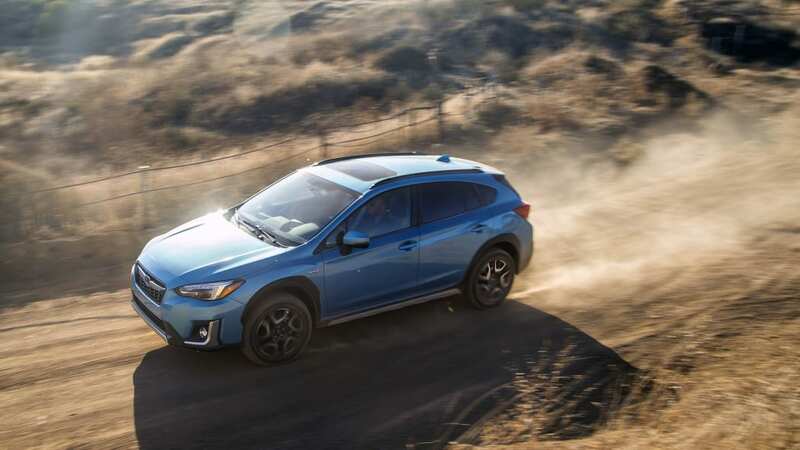 By the end of this year, Subaru will be selling its first plug-in vehicle, the 2019 Crosstrek Hybrid. 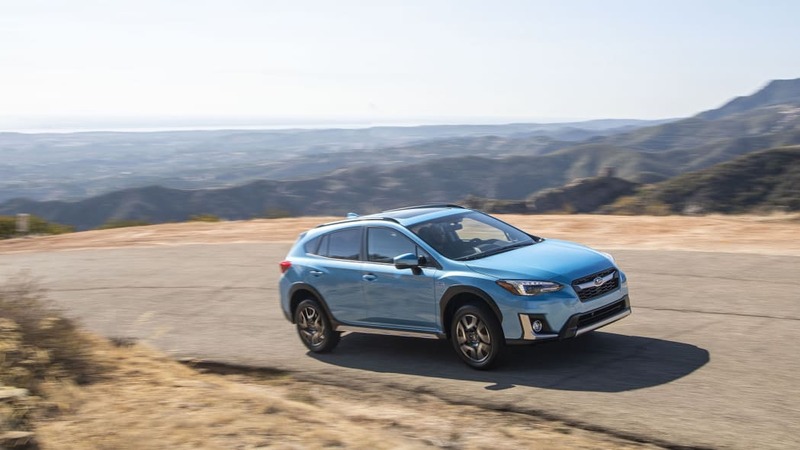 While Subaru has sold a Crosstrek that was a conventional hybrid before, the new 2019 Crosstrek Hybrid is Subaru's first plug-in hybrid. 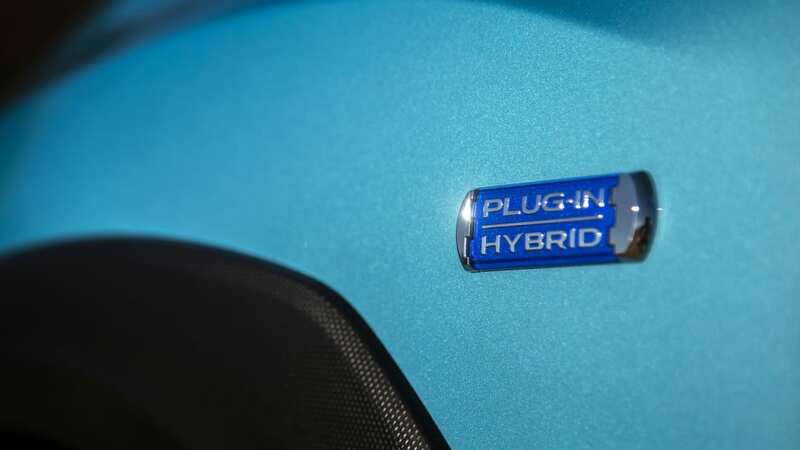 Sales of the previous hybrid weren't great, though, since it was expensive. 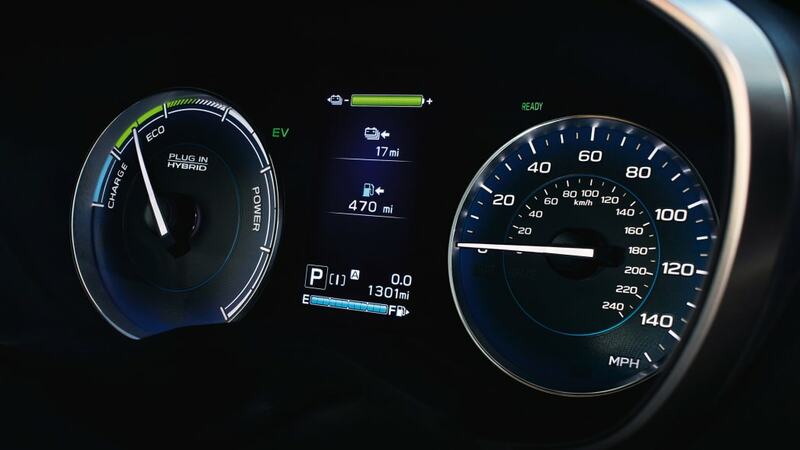 Customers didn't choose to pay a premium for a few mere extra miles per gallon. 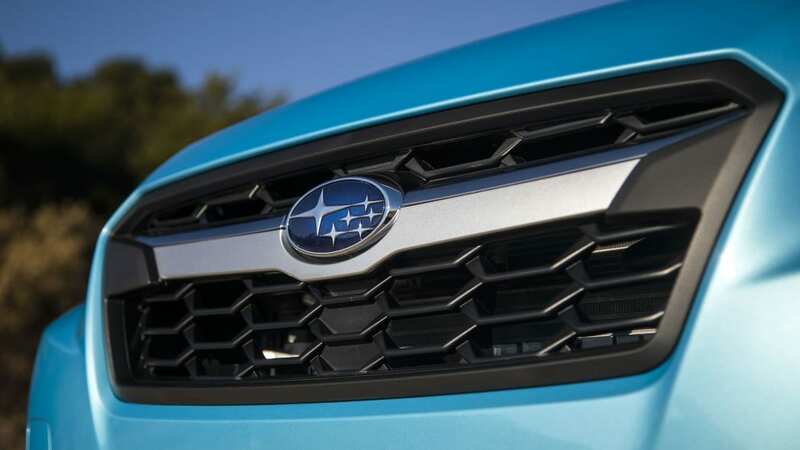 Subaru hopes the extra fuel efficiency of the plug-in will increase the appeal. 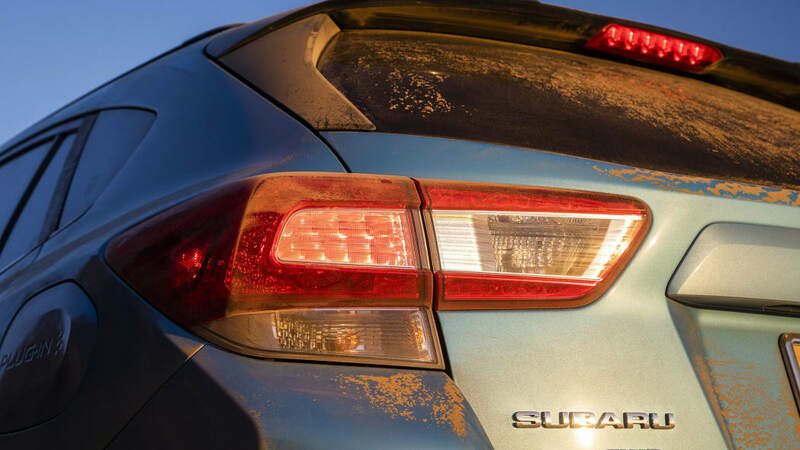 Even so, like Chrysler did with the Pacifica Hybrid, Subaru opted not to put "plug-in" in the name for 2019. 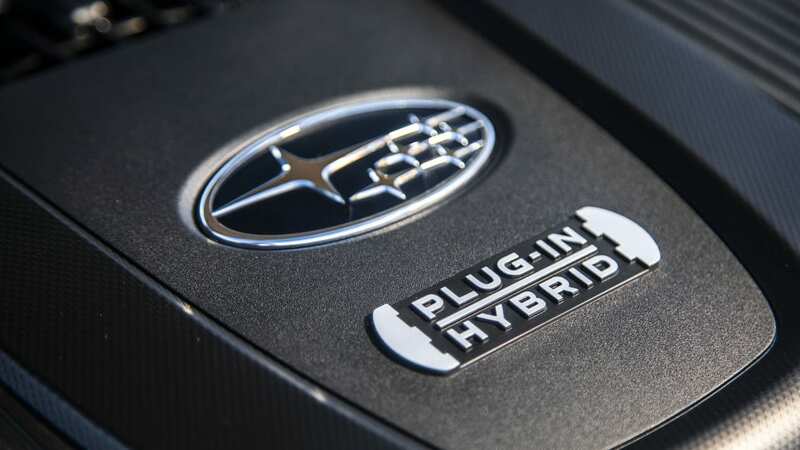 Despite an arguable opportunity missed to set the record straight with a new and more descriptive name, there's no mistaking this thing is a PHEV. 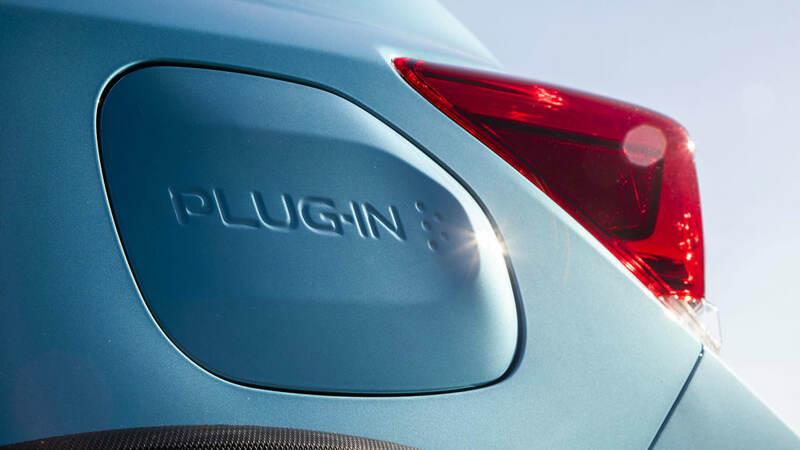 There are "Plug-In Hybrid" badges on both front fenders and the tailgate, and the door covering the SAE charging receptacle – at the rear of the driver's side, on the opposite side of the gas fuel door – is stamped with the words "PLUG-IN" writ large. If that figure is a little disappointing to you, you're not alone. 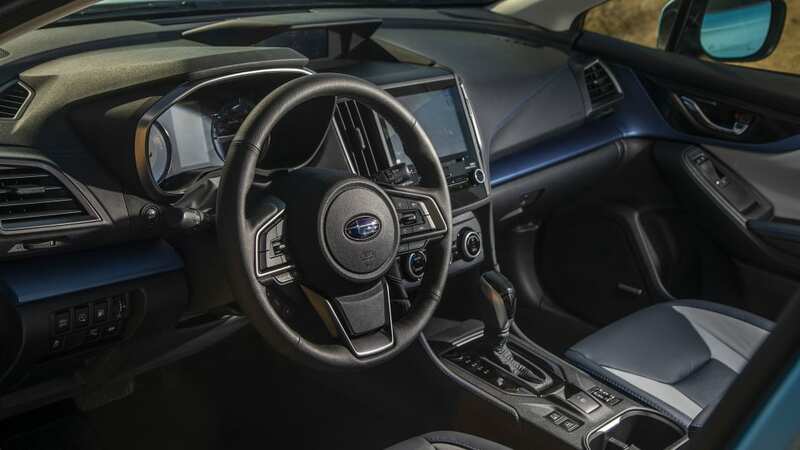 We had hoped to see at least 20 miles of EV range in this thing. 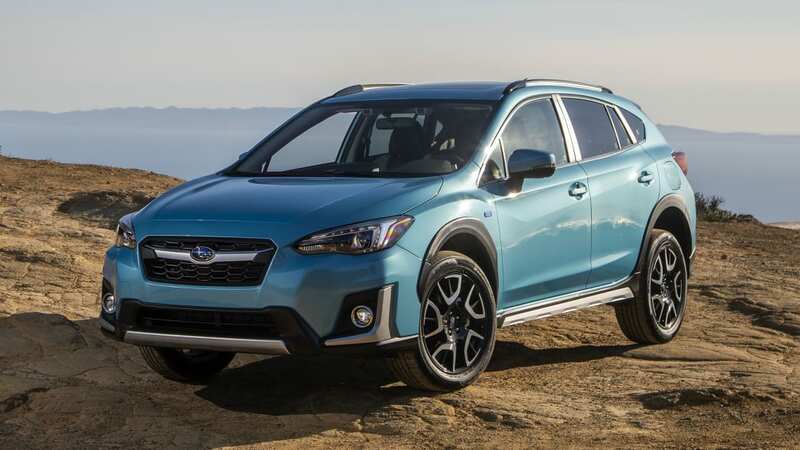 On the other hand, it's rated at 90 MPGe combined gas and electric, and a solid 35 mpg combined on gas only. Additionally, it doesn't take long at all to charge it up. 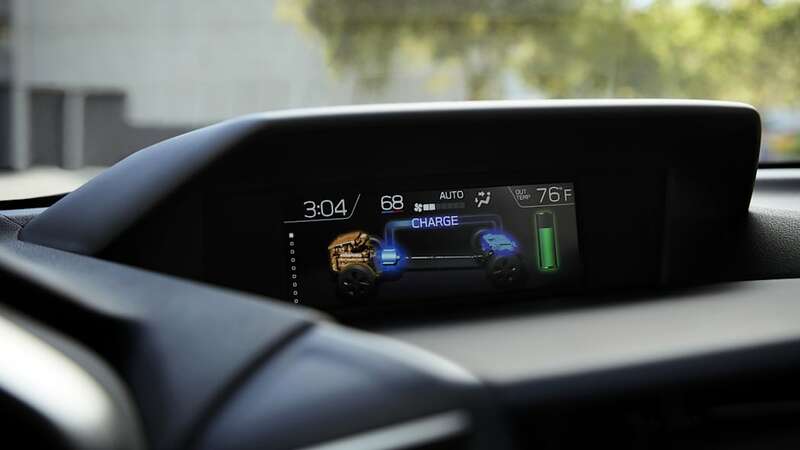 It'll refill in about two hours on a Level 2 charge, or five hours on a regular household 120-volt outlet. 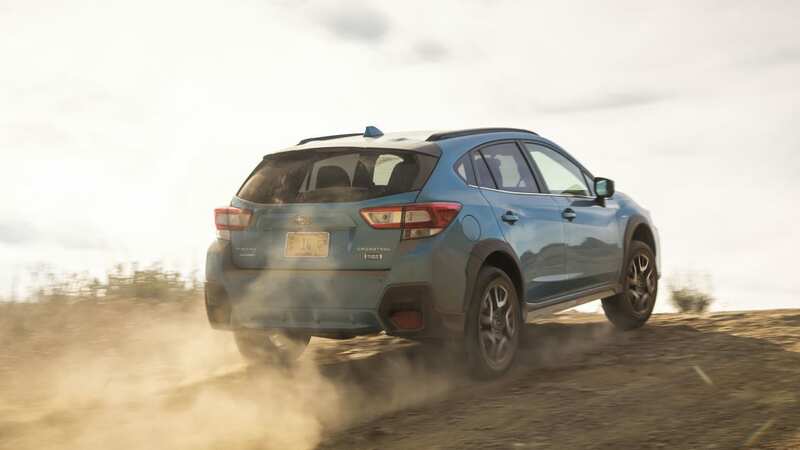 In addition to the gas engine up front which helps to drive the wheels, the Crosstrek's parallel hybrid system employs two electric motors, also on loan from Toyota, both integrated into the Crosstrek's transmission. 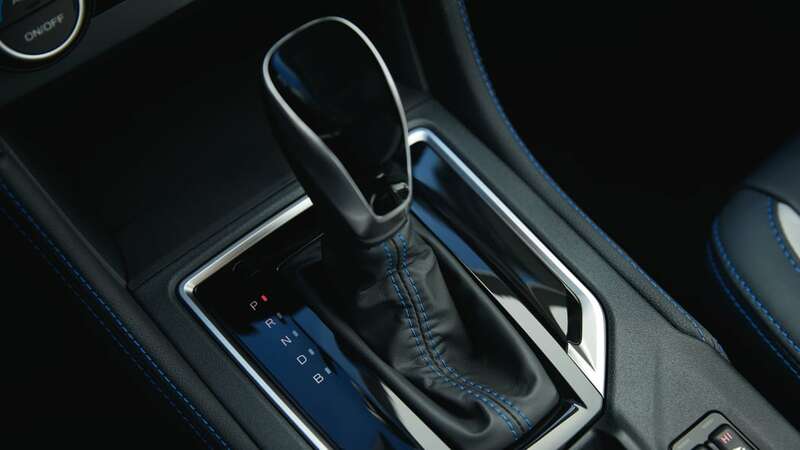 One puts power to the wheels and feeds power back through regenerative braking, while the other acts as starter motor and a generator to charge the battery pack through the internal combustion engine. 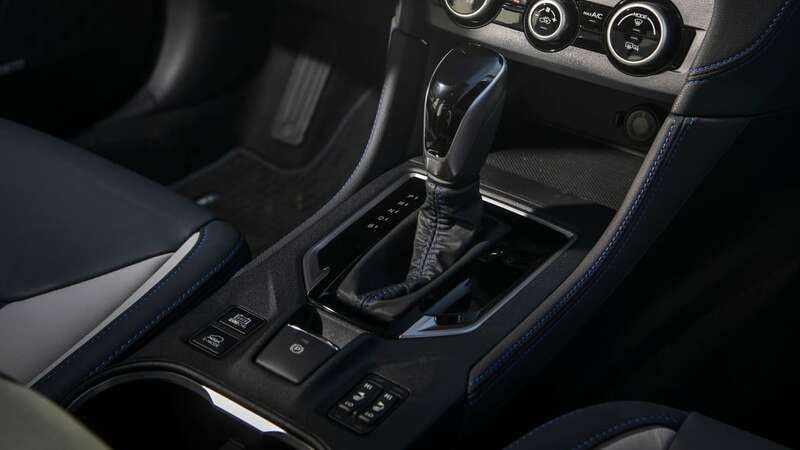 What this car does offer, though, is full-time all-wheel drive, just like almost every other Subaru, save the Sporty rear-wheel-drive BRZ coupe. 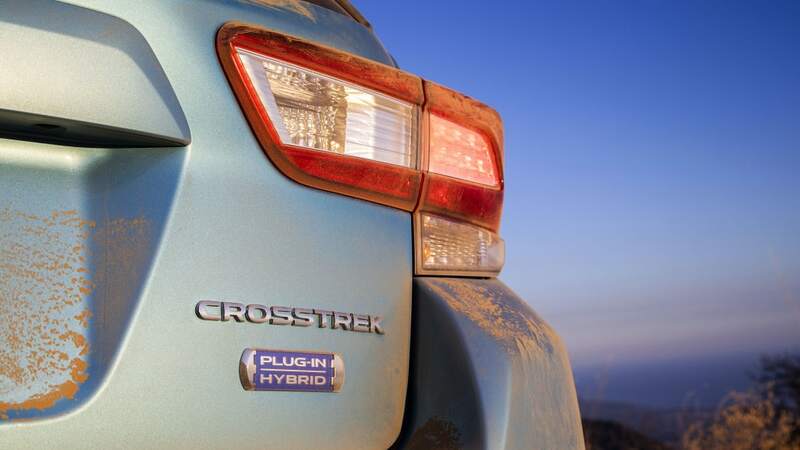 Unlike some "all-wheel-drive" PHEV crossovers, which only direct electric power to a single axle making them all-wheel drive only when electric power is applied, all of the Crosstrek Hybrid's power, whether from the gas or electric motor, is routed to all wheels through a single multi-plate transfer clutch at the transmission output. 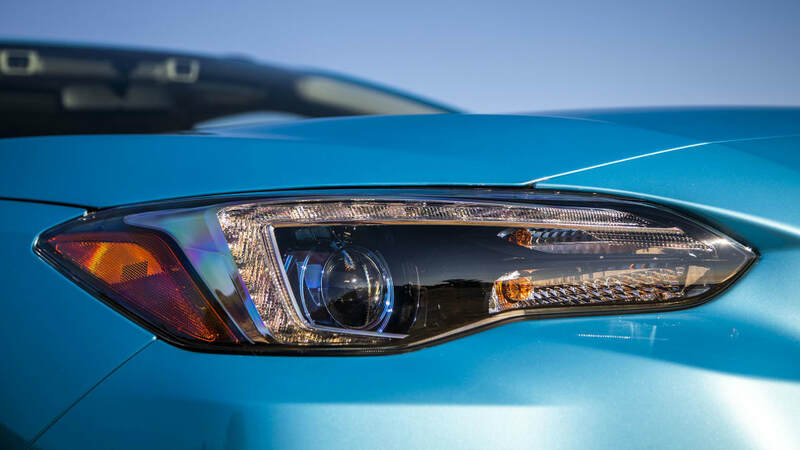 It's an attractive vehicle, especially in the new Lagoon Blue Pearl paint color. 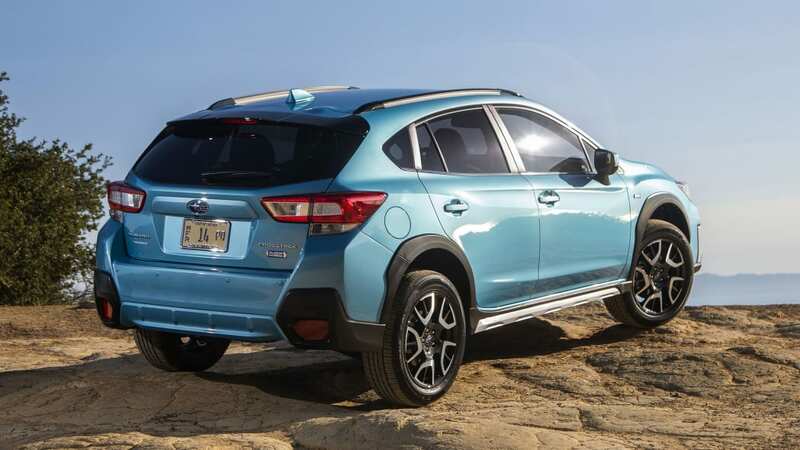 Besides the badges, it has a few subtle design cues that set it apart from the standard Crosstrek — and thankfully they're tactful and well-integrated while still looking fresh. 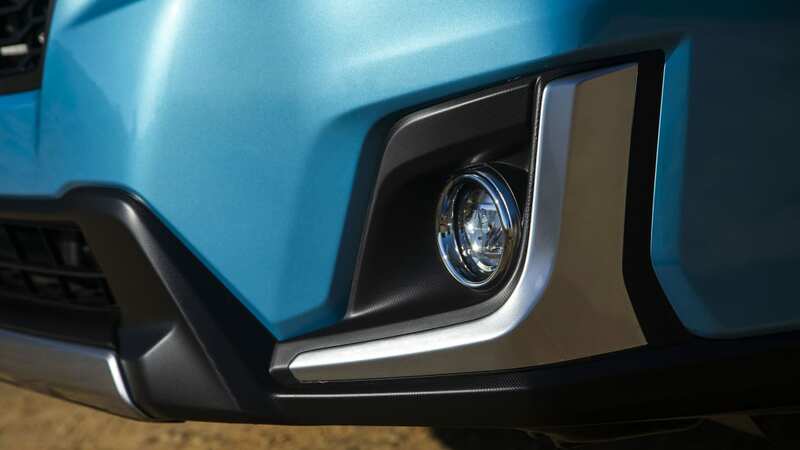 It sports silver accents across the grille and bottom of the front fascia, around the fog lights and along the rocker panels. 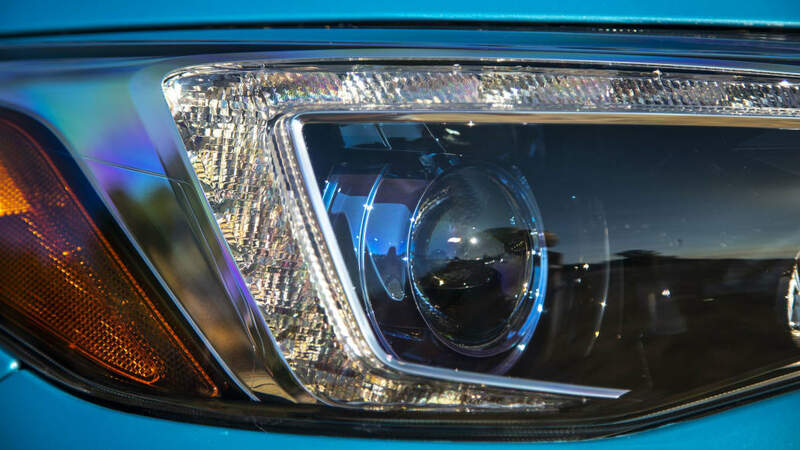 Blue rings surround the lighting elements inside the headlights. 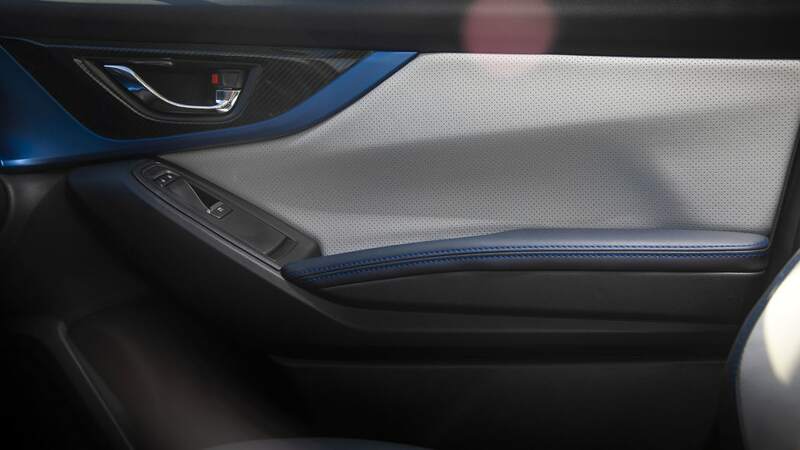 The low-profile roof rails reduce drag. 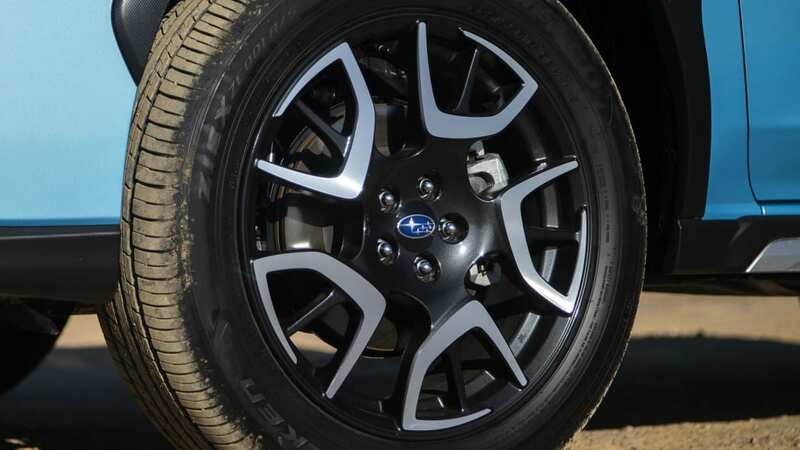 The lightweight 18-inch wheels in black and would look at home on a more rugged, all-gas crossover, and were chosen for their looks, even at the cost of aerodynamics. 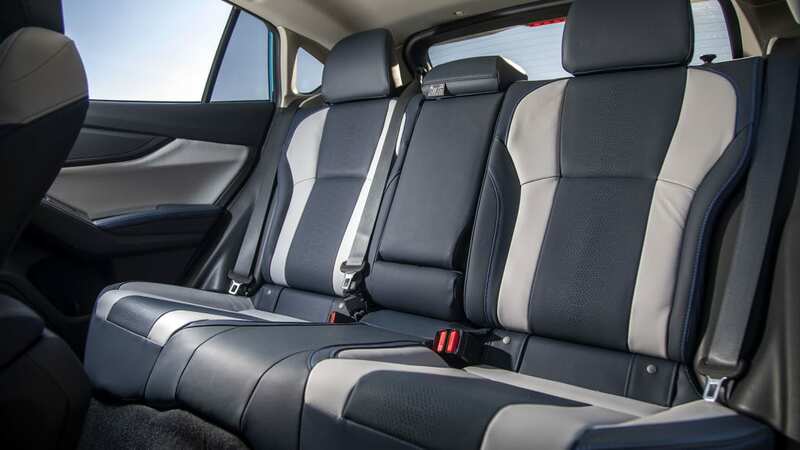 The second row is of decent size, and has that same two-tone seating. 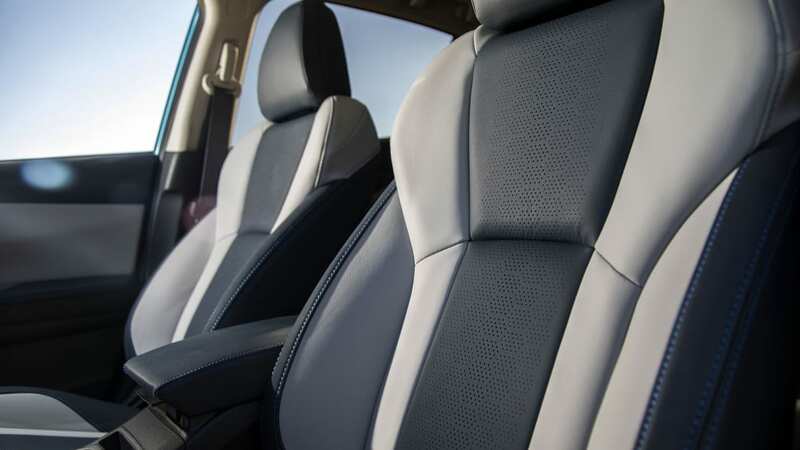 It's a little tight for adults on long trips, but certainly good for bringing another couple to dinner, and definitely adequate for children. 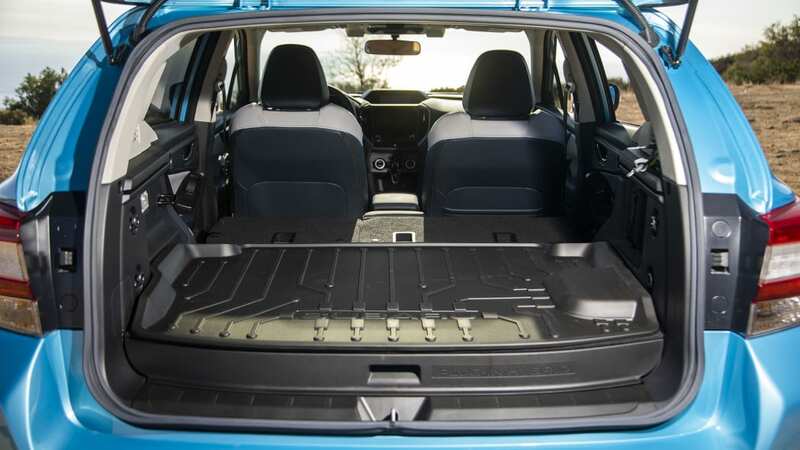 The bummer about the plug-in hybrid battery is that it lifts the rear cargo floor up a good 6 inches, sacrificing about five cubic feet of cargo volume compared to the standard Crosstrek, with a total of about 16 cubic feet behind second row. 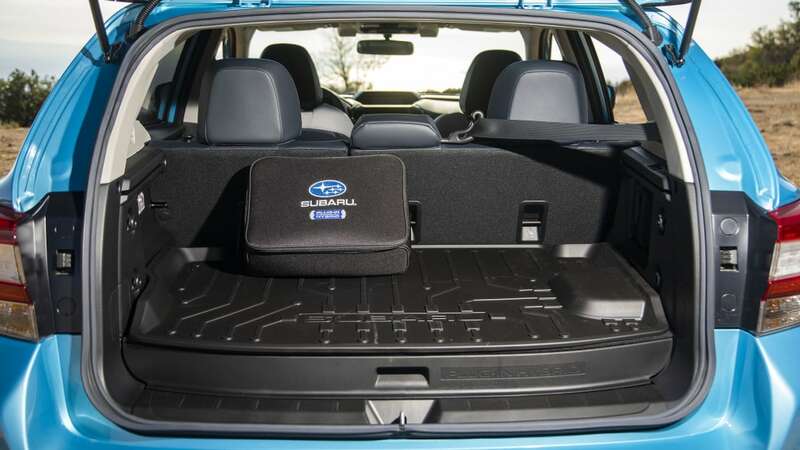 That's similar to the trunk of your average mid-size sedan, which is enough for each occupant to bring a carry-on, but it negates some of the added utility you'd expect from its crossover/hatchback body style. 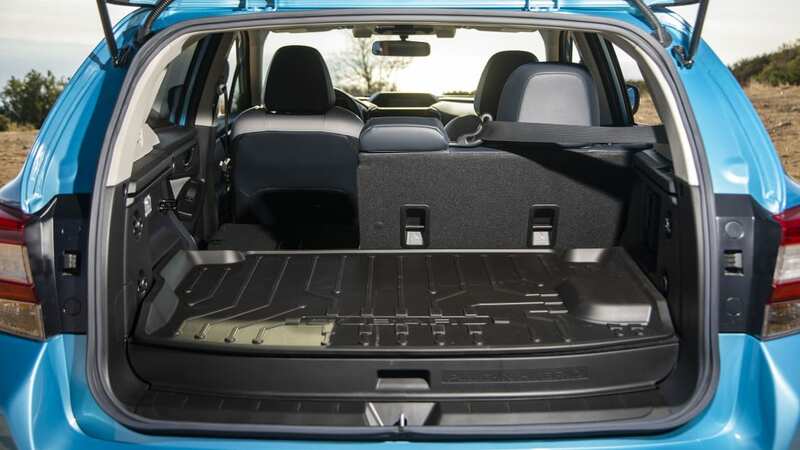 Dropping those seats forward brings that total to about 43 cubic feet. 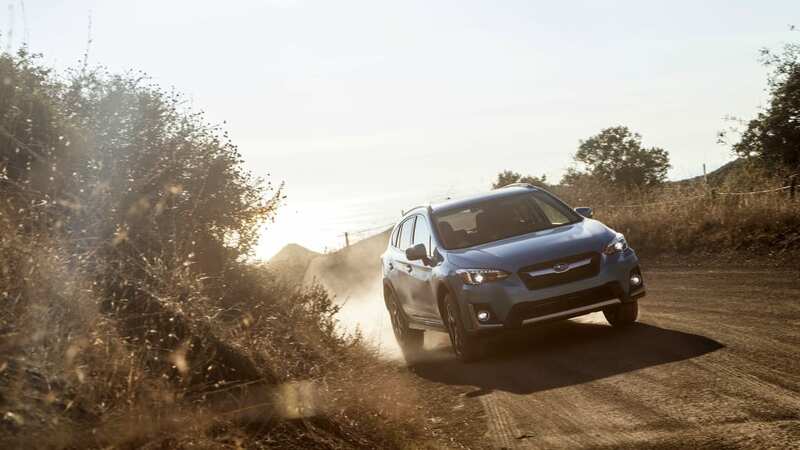 Taking off through Santa Barbara, the quiet Crosstrek Hybrid makes a positive first impression, pulling away smoothly and silently under electric power (a pedestrian alert sound is inaudible from the interior). You do hear the whine of electric motors, but that can be overcome with the radio on. 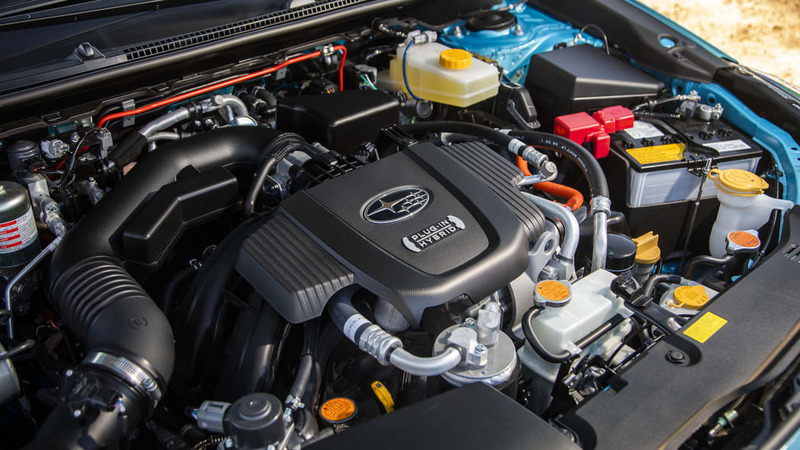 The boxer engine up front is also quiet, even at full power under hard acceleration. 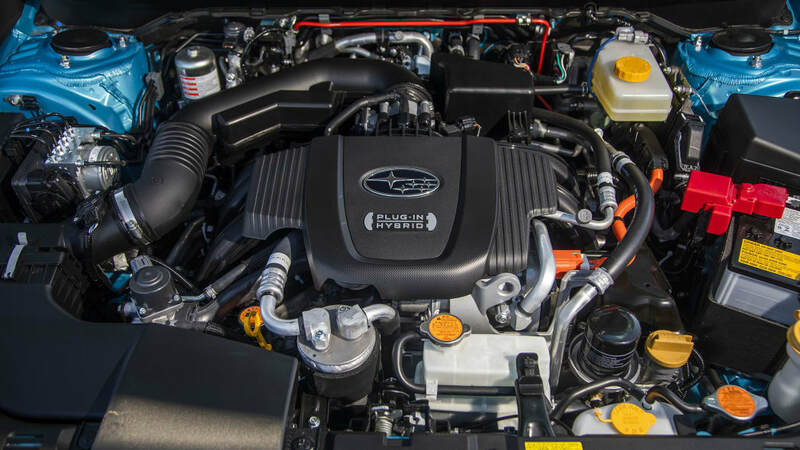 The 2.0-liter engine's 137 horsepower and 134 pound-feet of torque are bolstered by the electric drive's 118 horsepower and 149 pound-feet of torque — the peak combined system output is 148 horsepower. 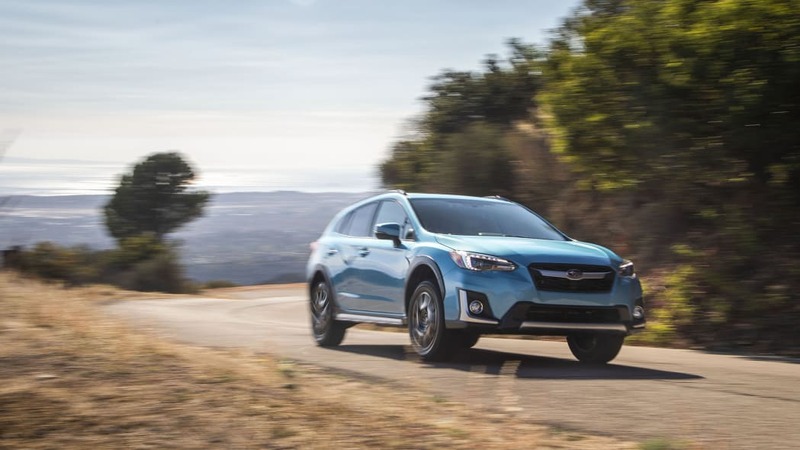 That's just shy of the gas Crosstrek's 152 horsepower, and the Hybrid weighs about 500 pounds more. 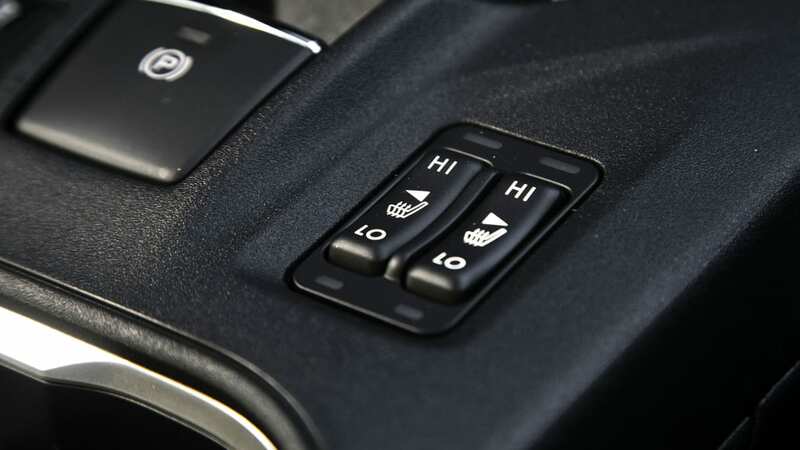 Low-end torque makes it feel peppy off the line — and poking the SI-Drive button into its sportier setting makes it feel even sharper — but you realize it's not a quick car when you accelerate to highway speeds, which isn't unusual for PHEVs packing that extra battery weight. 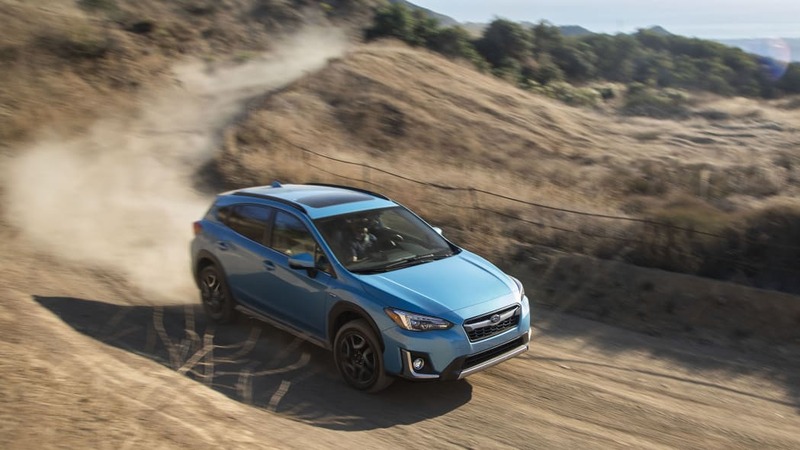 It seems sluggish climbing to 60 miles per hour, but at 9.3 seconds but actually a second quicker from 0-60 than the standard Crosstrek. 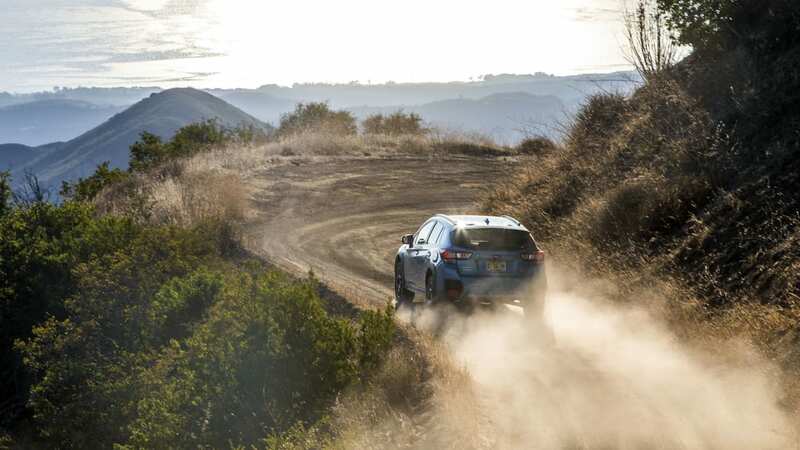 For most of the time we drove it, regardless of speed, we didn't notice a lack of power unless we were doing a high-speed passing maneuver or accelerating uphill. On pavement, it's a calm, comfortable, predictable ride. Eventually, though, we ran out of pavement. 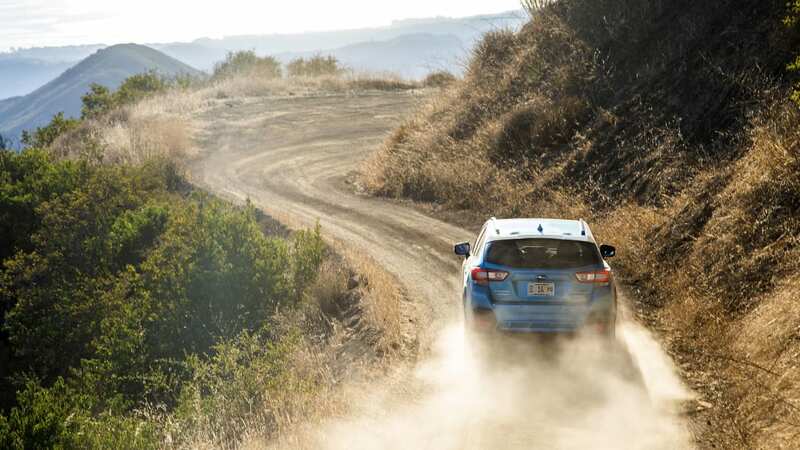 We spend a good number of miles on stretch of what, while technically a road, was not the sort of terrain we'd want to take most cars. West Camino Cielo winds around until the pavement ends, then climbs toward the sky on a path that is about equal parts dust and bare, rough bedrock. 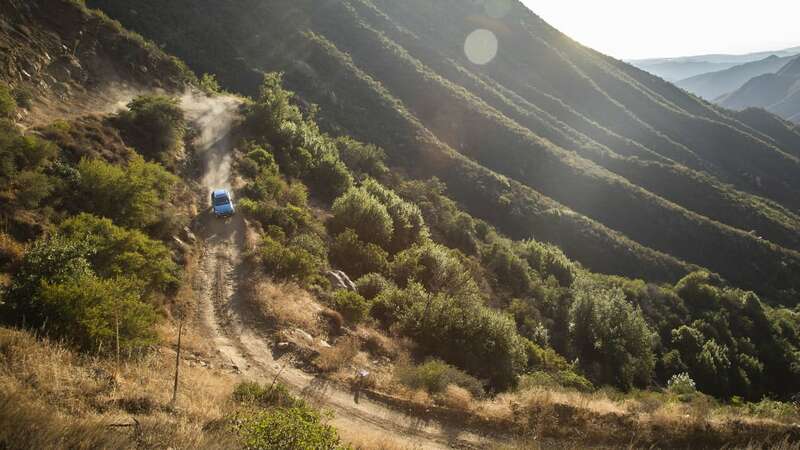 It's deeply rutted and uneven with a lot of steep inclines and declines that are also off camber. 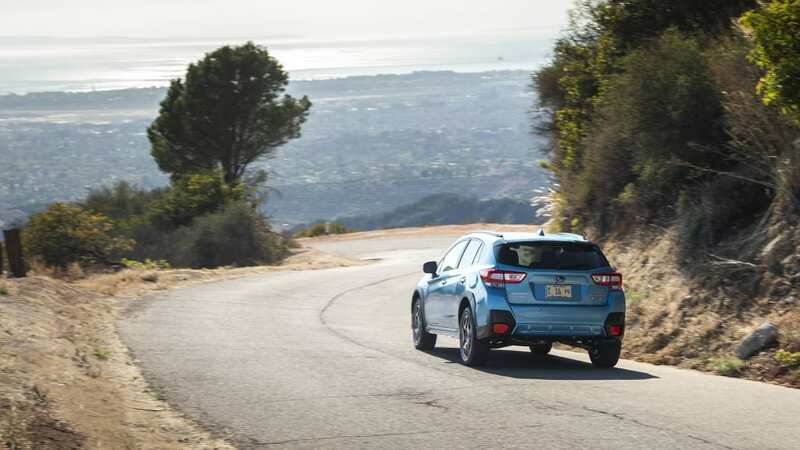 This road really put the car's suspension to the test, as well as its traction control. 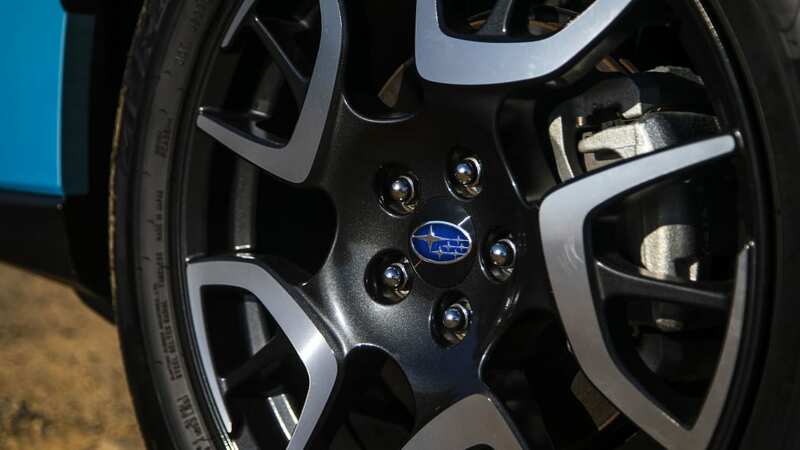 We were tempted to pop it into X-Mode, but we didn't find the need with the ample traction already on hand — we'll be sure to test it out when we can torture the car in some snow or mud. 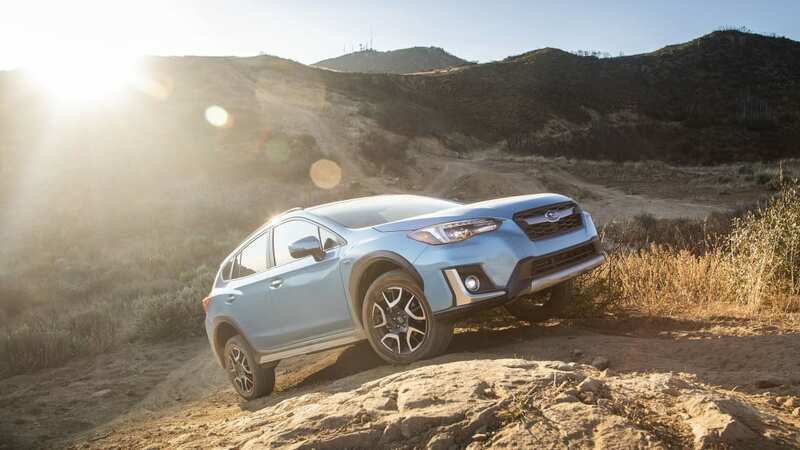 The Crosstrek Hybrid gobbled up the rough road in stride, although in doing so it transferred enough motion into the cabin that we were glad we didn't have passengers along. 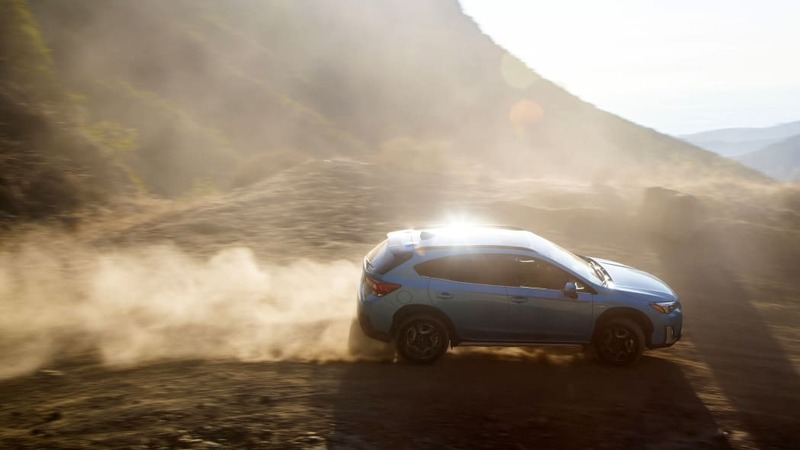 Even so, we came away impressed that the Crosstrek Hybrid could actually take that sort of punishment. 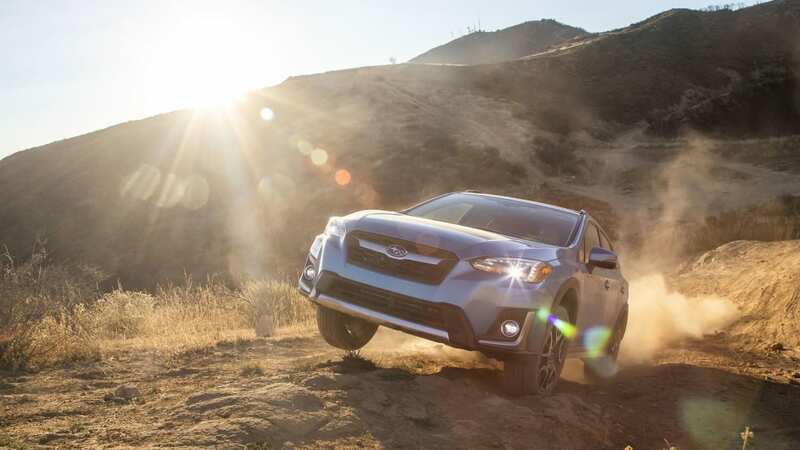 Driving uphill over rocks that were a few inches high, we found the low-end torque offered by the electric motors to be superb. 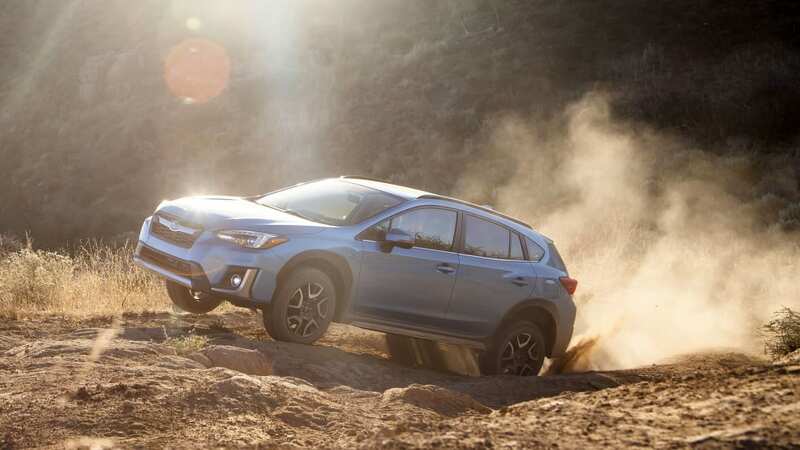 It allowed us to creep over the obstacles without having to carrying a footful of revs that would have caused us to jerk forward and dig into the brakes once free of the rock. 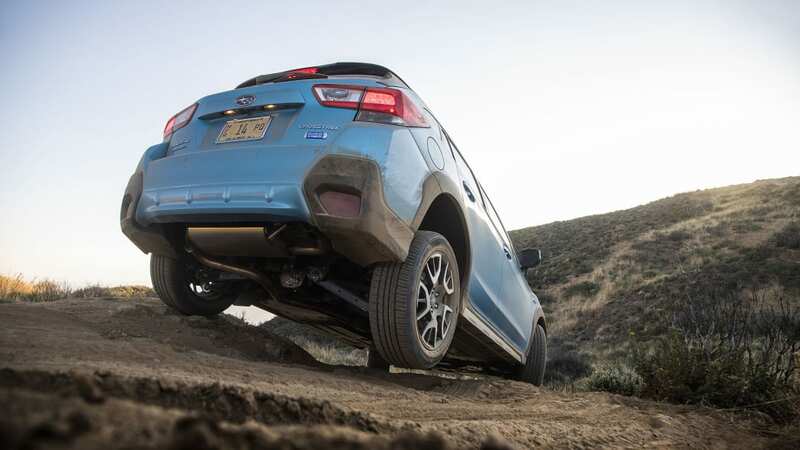 Instead, the Crosstrek Hybrid allowed us to tackle it with a steady, controllable creep. 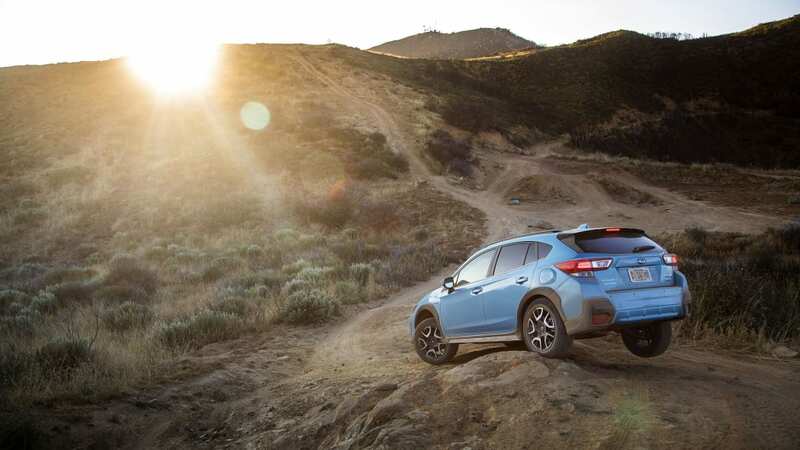 The car felt confident on the steep grades. Going downhill, we moved the shifter to B, and let the more aggressive regen keep our speed down. 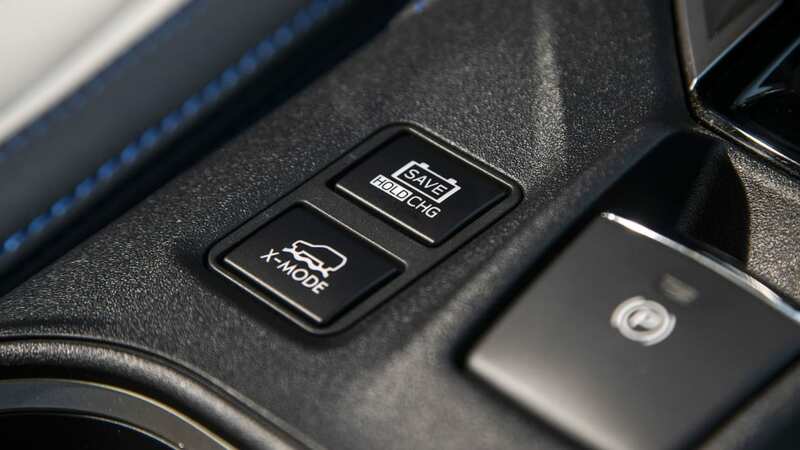 If you need to creep down a particularly nasty, slippery slope, the X-Mode feature includes hill descent control. 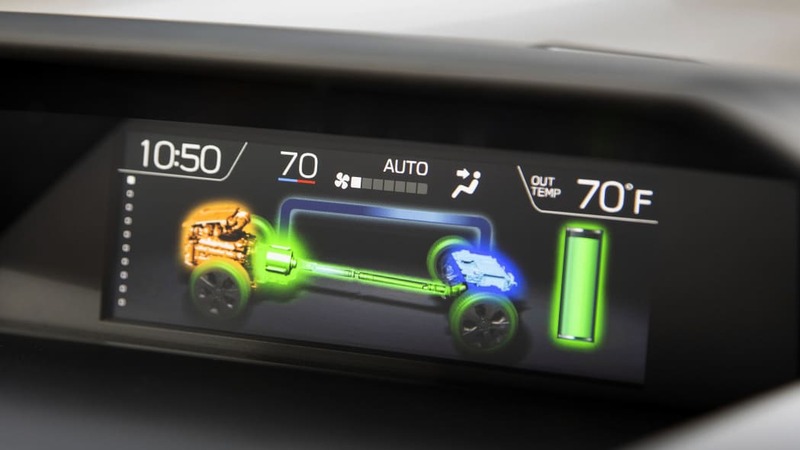 There's no way to lock out the gas motor to drive purely in EV mode. 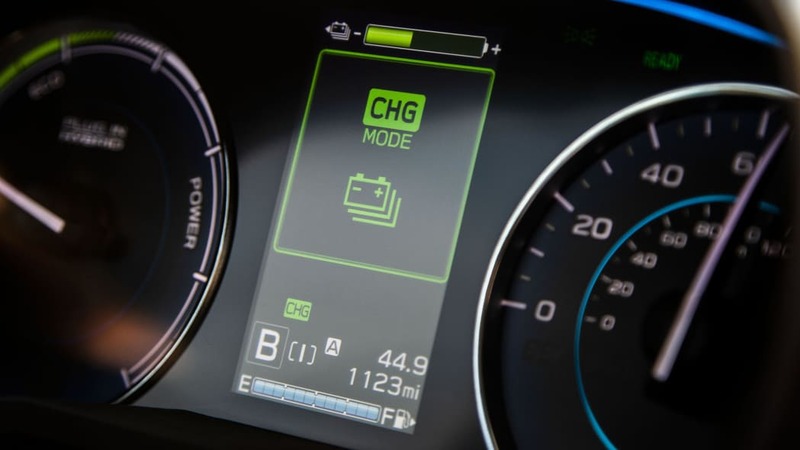 While it uses electric power as much as possible, if you accelerate too hard, drive over 62 miles per hour or start up in cold temperatures, the gasoline engine will automatically kick in to help. 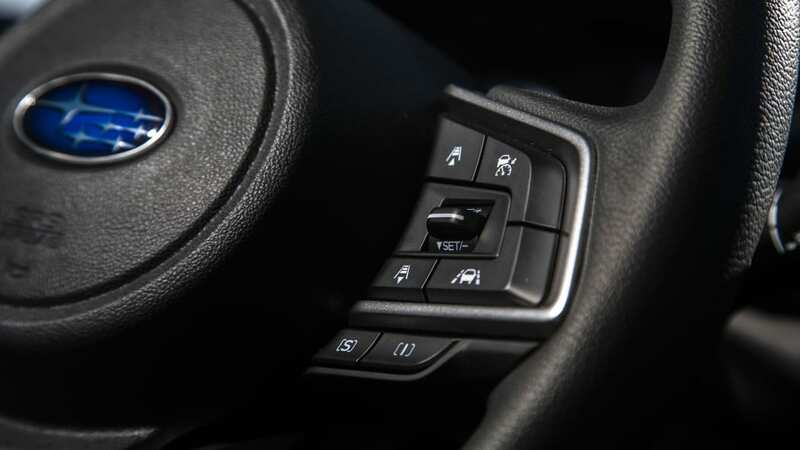 There is a Normal/Save/Charge button near the shifter that allows you to either maintain the battery level, or run the engine to charge the battery up so you can drive mostly under electric power later. 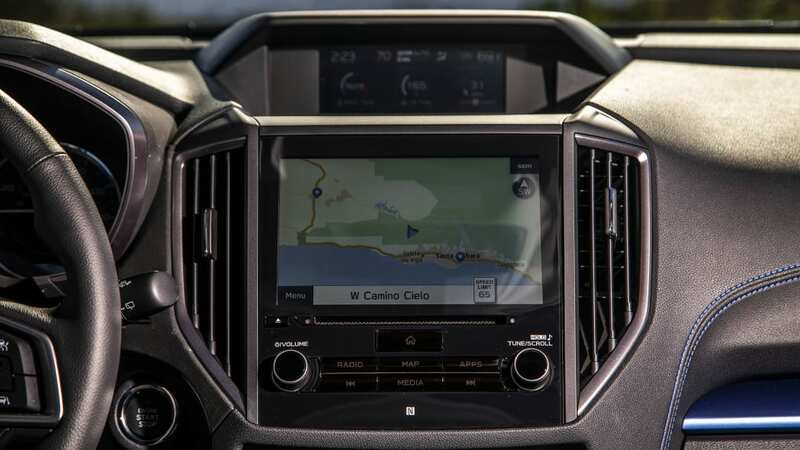 While you're driving, you can keep tabs on whether the car is using or charging the battery or running the gas engine with the Energy Flow Display on the little screen above the central touchscreen. 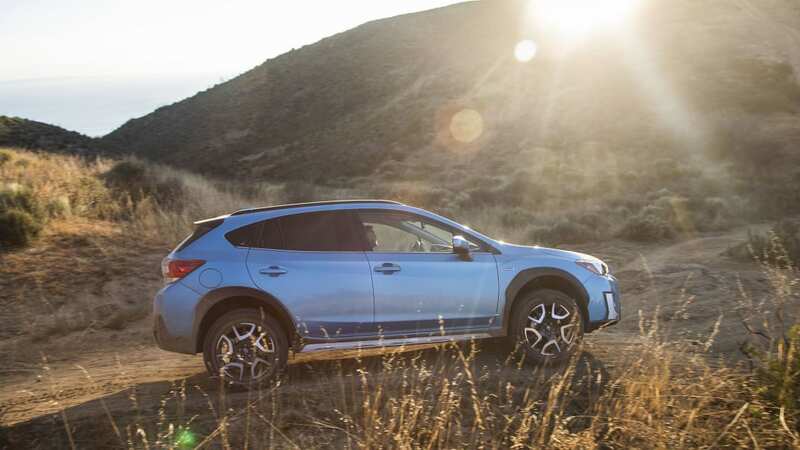 Or you can just ignore it, forget that all this magic is happening, and just use the Crosstrek the way you would any other car, while enjoying the quietude the Hybrid affords. 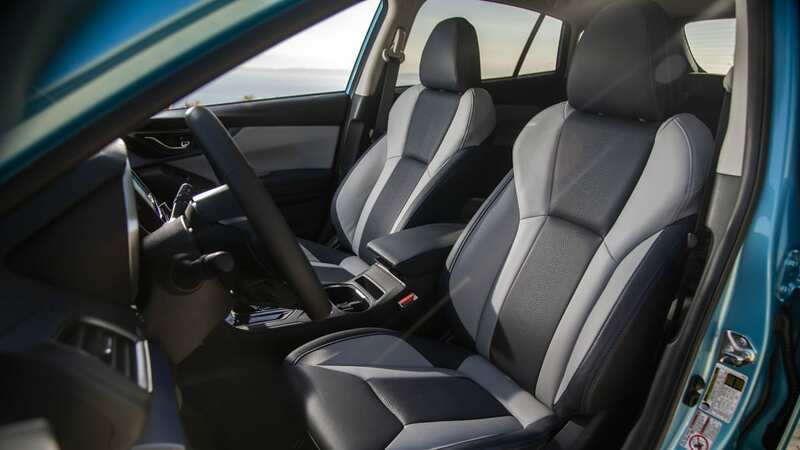 The Crosstrek Hybrid starts at $35,970, and is similarly equipped to a Crosstrek Limited, with a standard leather interior and 18-inch wheels, keyless entry, eight-inch infotainment touchscreen with Apple CarPlay and Android Auto, auto climate control, heated seats electronic parking brake, and EyeSight with adaptive cruise control. 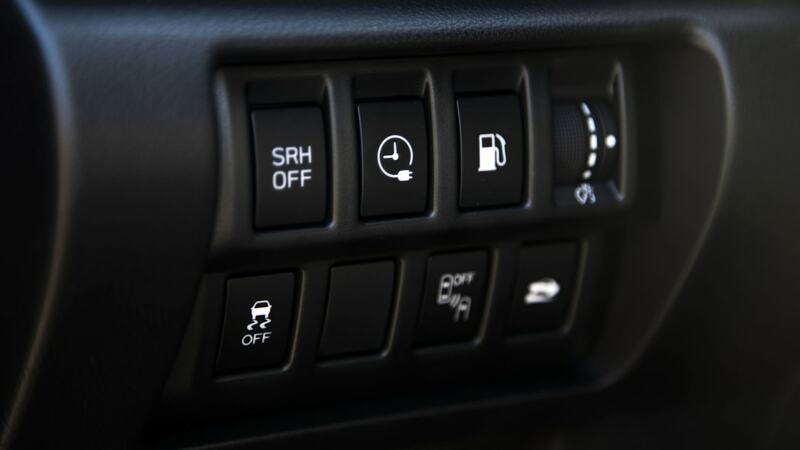 It also includes 10 years of the Starlink telematics package, with the ability to locate your vehicle and remotely control lights, locks, horn, climate control and battery charging. 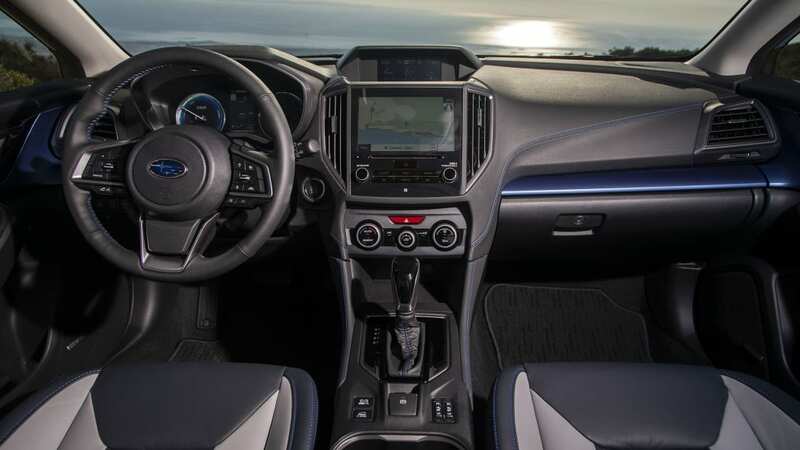 The only additional option is the navigation package with Harman Kardon audio, moonroof and heated steering wheel, bringing the price to $38,470. 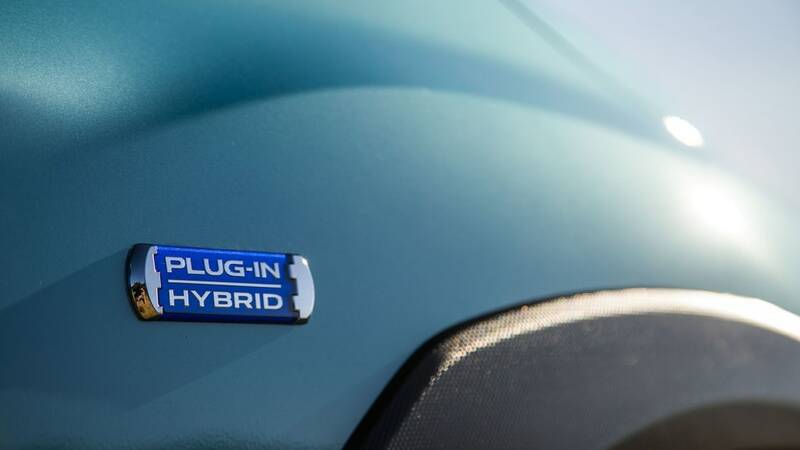 It'll be in inventory in the 10 ZEV states: California, Connecticut, Maine, Maryland Massachusetts, New Jersey, New York, Oregon, Rhode Siland and Vermont. 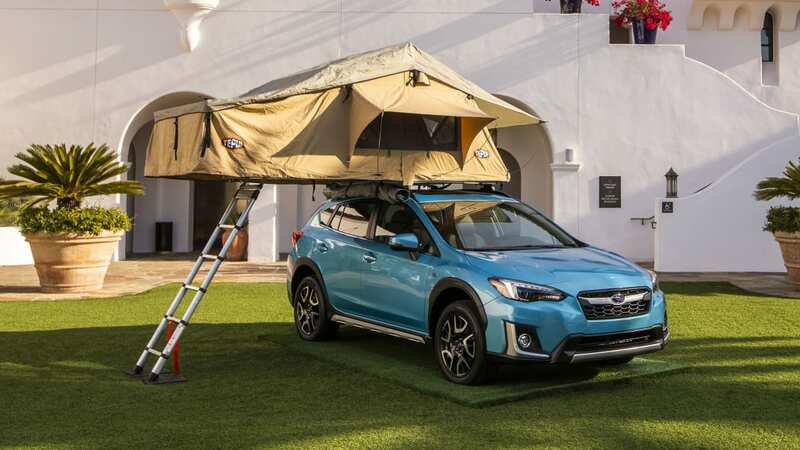 It'll be available everywhere else, but you'll just have to order it, and your local Subaru dealer may or may not choose to get the equipment and training necessary to service it. 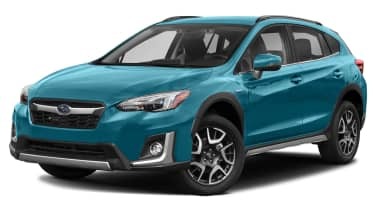 So should you go out and buy a Crosstrek Hybrid? 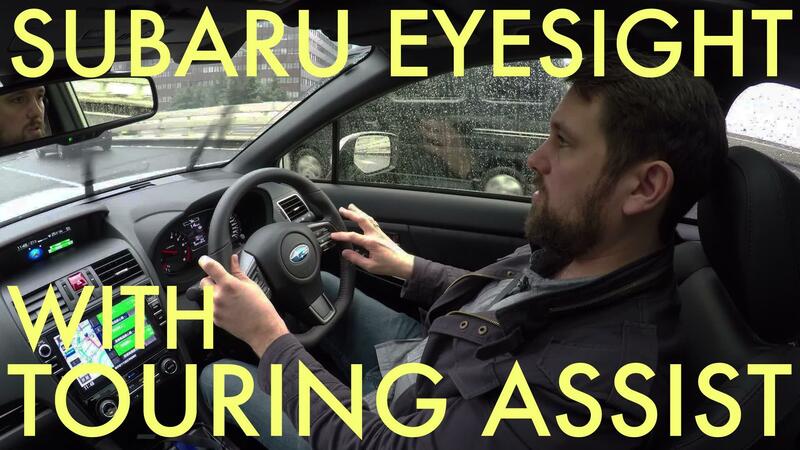 If you like driving Subarus, you'll like driving this. 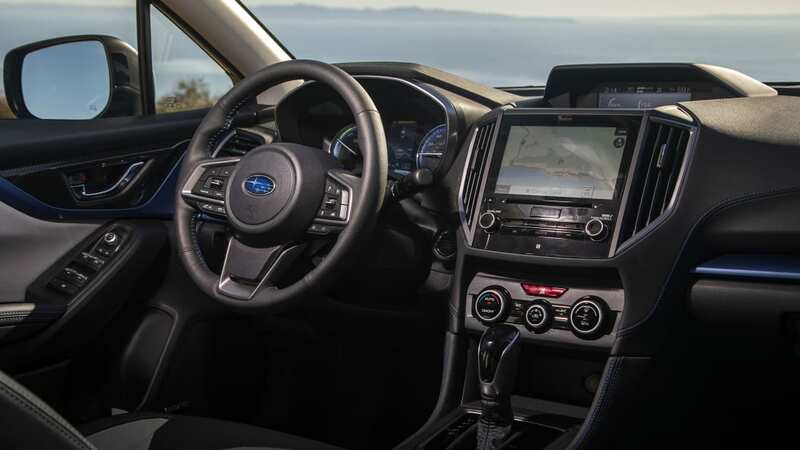 If you drive a lot, and want to use gas as little as possible, you might be turned off by the 17-mile EV range, but we think the fuel economy figures, versatility and quality of this Subaru make up for what, in the larger picture, is but a minor shortcoming. 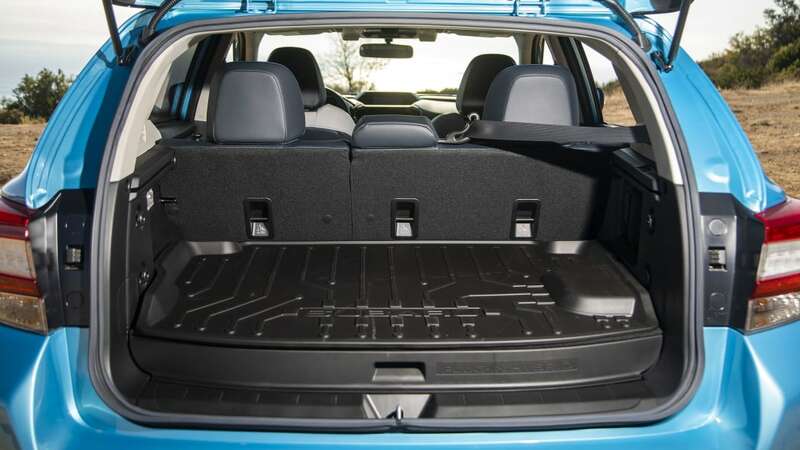 The issue that might be of greater concern is the downsized cargo area. It'd suit this author's day-to-day needs, like toting a kid in a car seat around to do our Christmas shopping. 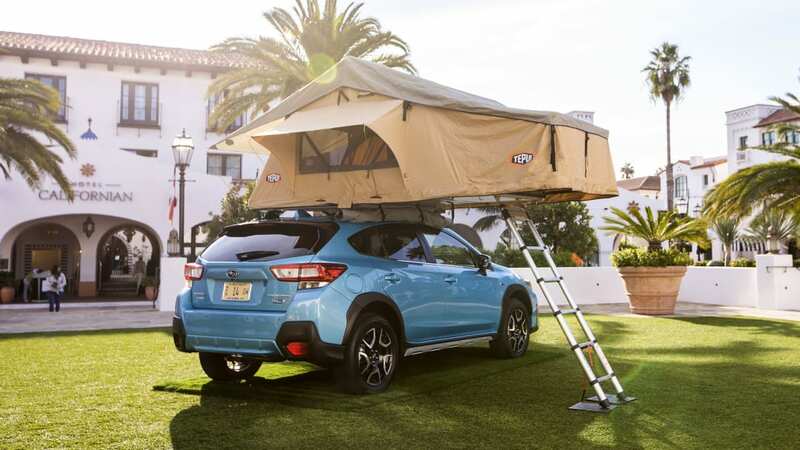 On the odd weekend where we needed to pack a bunch of camping equipment and supplies, we'd get a rooftop cargo box, or a light trailer and make use of the car's 1,000-pound towing capability. 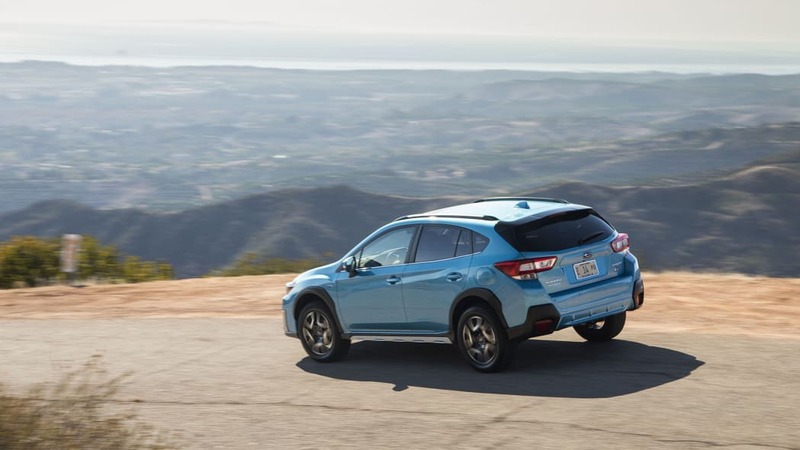 It seems like a small and rare inconvenience for having that affordable, efficient, comfortable all-wheel-drive crossover, especially in the friendly, familiar packaging of a Subaru. 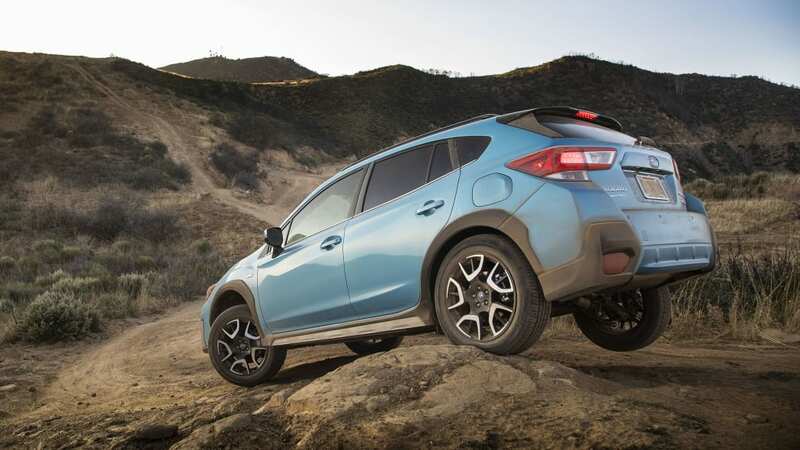 After all, if you want an affordable all-wheel-drive compact crossover — a popular combination — but also want a plug and freedom from range anxiety, what else are you going to pick?